Perennial flowers, such as echinacea and hydrangeas, do not require replanting every following year. A perennial will die at the end of the season and come back again next year from the same roots. There are many low maintenance and colorful flowers that can brighten your garden. You can choose flowers according to your specific requirements related to the flower shapes, range of colors, bloom times and heights of the plants. Most of these flower plants are evergreen, while a few will die in the fall and come back in the spring. 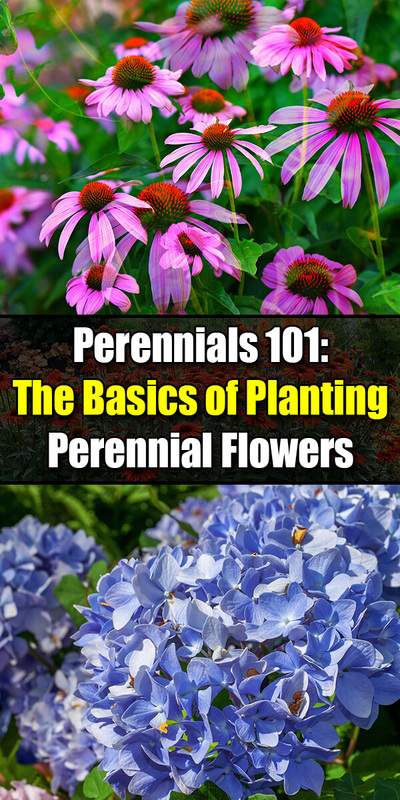 Planting perennial flowers is easy. You can combine perennials with other annual flower plants as well as with year-round shrubs in your garden. Choose only those perennials that are suited to your region’s climate and soil conditions. Springtime is perfect for planting perennial flowers. Some of the flower plants can be planted in the fall as well. Moist ground, warm sunshine, warm soil, regular rainfall and longer days are perfect for planting such flowers. This is the time when roots can grow easily into the ground. You will see good growth in stems, flowers, and foliage. If you are planning spring planting, let the new plant first adjust to the outdoor life. Leave it for a few days or weeks in a sheltered outdoor spot. Initially, leave it outside only for a few hours. Slowly, you can increase this time until it can be left all day and night. Bring the plant inside if outdoor frost is going to be a problem. Plant a perennial in the late afternoon on a cloudy, cool and damp day. Provide good mulch around the plant. Soak the root soil with the required amount of water. Make sure the water drains well but does not drain so fast that the soil turns completely dry within hours. Waterlogged soil can be a problem as well because it prohibits oxygen reaching to the roots. It will lead to rotting of the roots. Many perennials can be planted during the autumn season. The lower intensity of sunlight and cool environment is perfect for planting these flowers. The weather is less stressful for the new plant and there is less an issue of weeds. Start planting perennial flowers with proper site preparation. You can ensure healthy plants with healthy soil. Test the soil pH and depending on the result add lime if required. Add the required amount of compost, manure, peat moss or other organics to ensure good growth of your perennial flowers. Be careful when using the fertilizer. Add only the required amount of fertilizer and only when needed. When digging a hole for planting the perennial, make sure the size of the hole is double of the container in which the perennial flower comes in. The loose soil all around helps the roots grow easily. Keep these things in mind when planting perennial flowers and you are sure to have a garden full of colorful blooming flowers.